Speed! Up to 4X faster than the Unity editor’s built-in .obj importing. A 4MB .obj file will typically be parsed and the model generated in < 1 second, depending on CPU speed. High compatibility: loads most .obj files generated by different apps. Optionally generate tangents for use in shaders that need them, such as normal-map shaders. Read groups in the same file as separate meshes, or combined into one. Groups can also be read as submeshes. Read UV info and normals, or choose to auto-generate normals. Objects can be scaled, rotated, and positioned by any amount on import. Includes .mtl file support with texture loading (.png and .jpg format only). Note that the .obj format has no animation support. 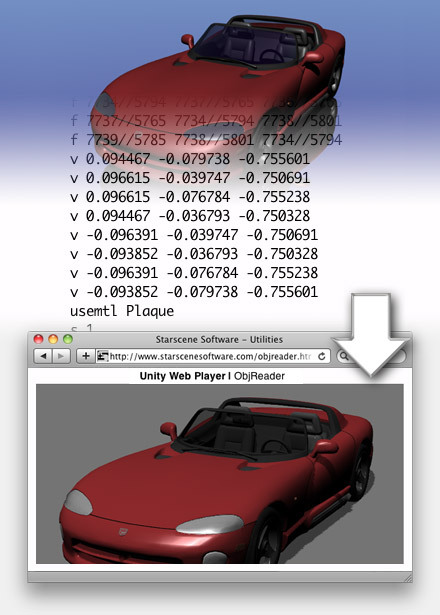 ObjReader requires Unity 3.5 or later (and works with Unity 4.0 or later, including Unity 5 and Unity 2017). Several licenses are available to suit your needs, starting at US$14.95. Source code is included, works on most platforms including mobile. See more feedback about ObjReader and other utilities!